For either reason you are now in the right place. Genie Beauty is home to the best anti aging cream on the market. It has been proven again and again not just by us saying it is so rather by the thousands of happy users of Genie Beauty anti aging products. Founded by Lisa Claycomb Genie Beauty has a full line of skin care and makeup products all designed to provide instant skincare and instant benefits. Many of you are familiar with the QVC shopping network but what you are probably not too aware of is just how good a product needs to be in order to be featured. QVC does not let any ole’ product on especially when it comes to skincare or anti aging creams. In fact as a QVC product Genie Beauty anti aging cream is held to a high standard both before and after the airing of a show. If people complain or provide negative feedback on an anti aging cream QVC will no longer allow the product to air. Think about that… unlike the other anti aging creams you see in a store or online ours have been scrutinized by the most demanding of customers… and passed! You likely also find yourself perusing Amazon for reviews and help finding the best anti aging creams available… Genie Beauty is there too. Take a look at the reviews and you will see an overwhelmingly positive response. With Genie Beauty anti aging cream the way you apply the product will dictate the results you experience. When customers do complain we find that 99% of the time their complaint is the result of mis-application, primarily over application, of the product. With the best anti aging cream it is important to apply Genie Beauty properly and in the right order. We have created a number of video and written tutorials to help you with the application of anti-aging cream products. Specific techniques, using a smaller than you would expect amount of product always result in the best look. What goes in to the best anti aging cream available? Ingredients are the life blood of anti aging products. Your skin as it ages looses elasticity primarily as the result if its inability to retain moisture. Our ingredients work to enhance the available moisture and keep it in place. 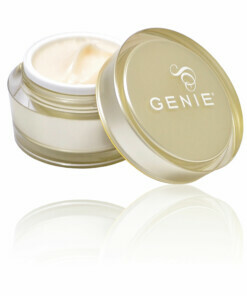 For new users of the Genie Beauty anti aging cream this sensation is described as smooth, soft, cool and comfortable. Our anti aging cream does not feel like makeup or lotion; instead it feels like a magic serum that is light and non-intrusive.